Professor John H. Bracey, Jr., has taught in the W.E.B. Du Bois Department of Afro-American Studies at the University of Massachusetts at Amherst since 1972. He is now serving a second stint as department chair, and is co-director of the department’s graduate certificate in African Diaspora Studies. His major academic interests are in African American social history, radical ideologies and movements, and the history of African American Women and more recently the interactions between Native Americans and African Americans, and Afro-Latinos in the United States. During the 1960s, Professor Bracey was active in the Civil Rights, Black Liberation, and other radical movements in Chicago. Since his arrival at UMass he has maintained those interests and commitments both on campus and in the wider world. 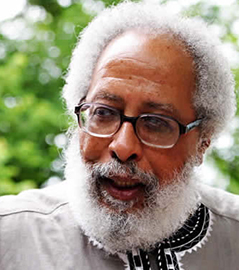 His publications include several co-edited volumes, include Black Nationalism in America (1970); the prize winning African American Women and the Vote: 1837-1965 (1997); Strangers and Neighbors: Relations between Blacks and Jews in the United States (with Maurianne Adams, 1999); and, African American Mosaic: A Documentary History from the Slave Trade to the Twenty-First Century (with Manisha Sinha, 2004). Professor Bracey’s scholarship also includes editorial work on the microfilm series Black Studies Research Sources (LexisNexis), which includes the Papers of the NAACP, Amiri Baraka, the Revolutionary Action Movement, A. Phillip Randolph, Mary McLeod Bethune, the National Association of Colored Women’s Clubs, and the Papers of Horace Mann Bond. Professor Bracey is a co-editor with Professor James Smethurst and Professor Emerita Sonia Sanchez of SOS: Calling All Black People: A Black Arts Movement Reader (2014). A major anthology of readings from the Black Arts Movement. Black Matriarchy: Myth or Reality?